Millions will turn their eyes skyward on August 21. They’ll be donning special glasses to watch the first total solar eclipse stretching coast-to-coast in America in a century. The eclipse -- when the moon blocks the sun’s rays from hitting Earth -- will cut across the mainland United States. Only a narrow path from Oregon to South Carolina will have total darkness, but people across the country will be treated to a partial eclipse. 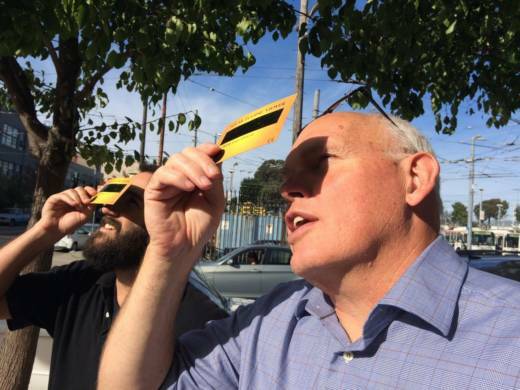 Hotels have sold out in prime viewing spots and Google has distributed more than 2 million eclipse-viewing glasses to libraries across the country. Retired Foothill College astronomy professor Andrew Fraknoi joins us today to talk about the eclipse and how best to see it. We briefly talk at the top of the hour with SF Chronicle's Washington correspondent Carolyn Lochhead about the GOP's latest efforts to repeal the Affordable Care Act. Andrew Fraknoi, professor emeritus of astronomy at Foothill College; author, "When the Sun Goes Dark"